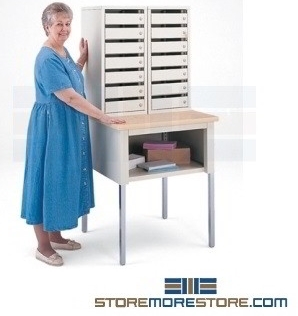 Locking mail cubbies are designed with individual locking compartments for sorting and distributing mail. This makes them an ideal solution for secure and private pick-up of individual mail and packages in hospitals, schools, offices, and more. Individual mail is delivered through slots in the compartments, and the back of the cabinet allows full access to all compartments with one large locking single door. The individual locking compartments deter theft and ensure that user mail is secure and protected. This also increases organization, as every compartment is clearly labeled. With doors that enclose the compartments, it provides your mailroom with a clean, professional look uninterrupted by messy piles of mail. These mail sorters are also modular, allowing you to bolt the units together for more seamless storage at any time. Authorized users can access all mail slots at once through the locking back door. Lastly, the sorters have a durable powder coat paint finish that is resistant to scratches and corrosion, making it a long-lasting solution. 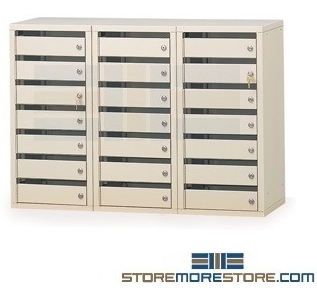 Locking mail cubbies are available to buy online and ship in 4-8 business days. For further assistance, call us at 1-855-786-7667 or send us a message to speak to one of our storage experts.